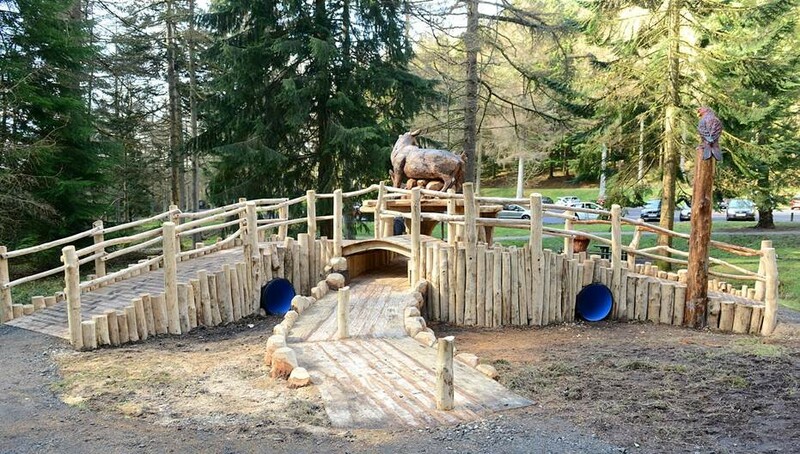 To encourage visitors of all ages to interact with nature within the Forest Park and particularly the younger generation through exploration and play within the forest environment. The centrepiece includes a family of red deer, reflecting the importance of the Forest Park’s relationship with its much loved wildlife. In addition an imitation waterfall encourages climbing and access by children and the auditorium creates a meeting space or a place to relax. The centrepiece surrounded by boardwalk paths and a bridge is wheelchair accessible. NGO Challenge Fund (Forest Service Northern Ireland stream) administered by NI Environment Link.